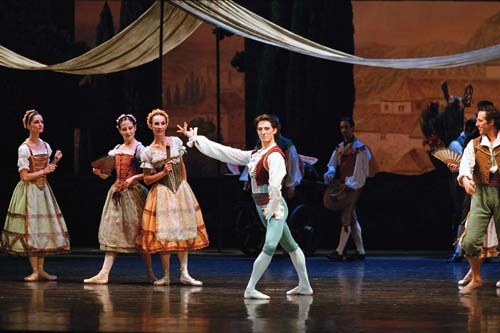 PARIS, 22 July 2004 - While Giselle packed the Palais Garnier, Rudolf Nureyev's boisterous and good-natured Don Quixote was staged simultaneously at the Opéra Bastille, which gave artistic director Brigitte Lefèvre the opportunity to cast several of the younger dancers in the main roles. After three remarkable performances alongside Agnès Letestu as Kitri, twenty-year-old Mathieu Ganio, who held the rank of sujet for his debut as Basilio on the 14th of May, found himself with the title of étoile after his last appearance on the 20th. This young dancer, (Franz in the Opéra School's production of Coppelia"*), has amply demonstrated that he possesses all the qualities required to be an étoile. He is tall and intelligent, with romantic good looks. As a youthful Siegfried in the Opéra's internal competition for promotion earlier in the season, he seduced with his supple elegance and the long sweeping arcs of his leaps, three of which sufficed to cross the stage. His interpretation of Kourbski in "Ivan the Terrible" displayed his natural dramatic gifts, the slender boy becoming a man in the force of age. And in spite of the fact that he is basically a romantic classical dancer, he rose to the challenge of Basilio the barber, teasing the girls and clowning around, all the while dazzling the audience with his formidable technique. From her very first entrance, Letestu lit up the stage with her beauty and charm. Quick-witted and flirtatious in the first act, mischievous and playful with her lover, she was also the most generous of partners. Totally in command of all the technical demands of the role, she was serene and lyrical in the vision scene. Something unusual was happening at the Sunday matinée on the 23rd. The air was electric and the theatre packed to capacity for Dorothée Gilbert, just twenty, partnered by Emmanuel Thibault, two of the Paris public's favourites. 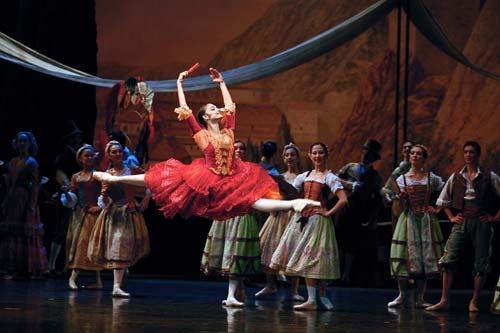 Both are sujet, a nonsensical ranking for Thibault now twenty-nine, which means they are part of the corps de ballet. The performance was quite simply unforgettable from the instant Thibault arrived on stage with the lightest and most breathtaking of jumps. Dorothée Gilbert is not only a brilliant technician, she is also bursting with vitality, life and charm while Emmanuel Thibault is quite exceptional. An outstanding artist, he introduced an element of the Commedia dell Arte into act one, while his interpretation of the mock suicide scene to trick Kitri's father into blessing their marriage was one of the best ever seen. But above all, the crowd craves Thibault because he can jump; his technique is sensational. He is light, effortless and aerial with soft, impeccable landings. The first act was a joyful explosion of virtuosity from Kitri and Basilio while the firework display at the end had the theatre roaring. Is there any other company in the world that can afford to hide a star of such quality in the corps de ballet?